We have given our Traders’ Board a complete make-over! 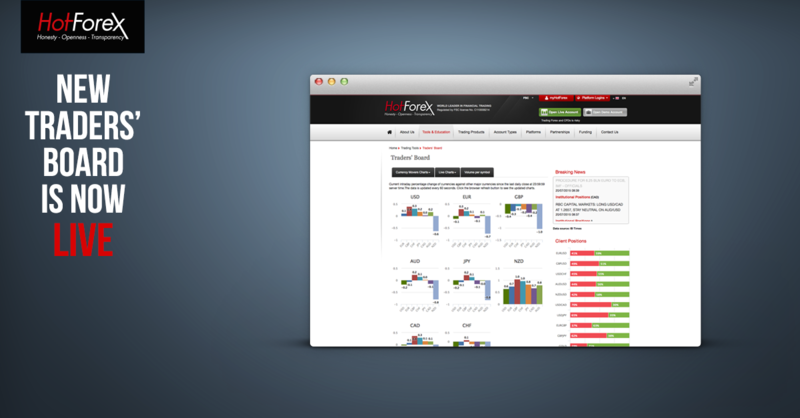 Check out our brand new Traders’ Board which is now live on the HotForex website. The redesign has enabled us to create a more user-friendly and informative page, to better equip you in your trading activities. You will now have the ability to identify overnight and five-day percentage changes in major currencies. - Data updated every 60 seconds – keeps you informed of the biggest currency movers of the day. - Aggregated client positioning - helps you gauge trading sentiment. - Volume traded by clients on a per symbol basis - shows the most popular traded assets. - Breaking news live feed - keeps you abreast of market changes that could affect your trades.